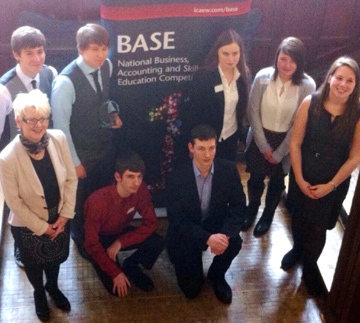 Students from Consett Academy beat off competition from 4 other local teams to win the second Newcastle heat of BASE 2014. The second Newcastle heat of the BASE competition took place at Northumbria University on Wednesday 12 March 2014. 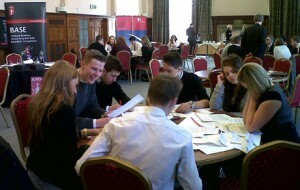 The BASE competition was supported by local firms including PwC, National Audit Office, Next Level Financial Management and Ryecroft Glenton who provided professional mentors and judges. 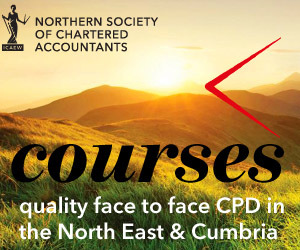 In addition students and teachers were given the chance to hear first hand accounts about the range of career options ICAEW chartered accountancy can provide. Consett Academy will now go on to represent their region at the national final which takes place at the Hilton Metropole Hotel, Birmingham on Wednesday 25 June 2014. Pictured are team members from the winning team Consett Academy with Jeanette Brown, President of Northern Society of Chartered Accountants and mentor to the team, Sarah Brown from PwC.